The Meridell marketplace was as it should be on a busy winter morning. Chaotic tracks trailed through the snow, the footprints of excited young Neopets as they dashed from store to store, exclaiming over the shelves and voicing their thoughts on what would be best suited to sit under their decorated tree on the Day of Giving, always loudly enough so that the long suffering owners who trailed after them could hear. Brilliant, merry baubles decorated the viridian boughs of every tree, lights strung from shop awnings and here and a delicious myriad of scents peppered the air as seasonal delicacies were prepared and sold. In the midst of all this merry chaos, two friends were having an argument. This emphatic demand was made by a delicate Royal Kyrii, a shimmering satin cloak regally thrown over her azure gown to protect her from the lightly falling snow. Only inches away, a rather rotund Plushie Draik stomped his foot firmly in the snow. Spectra rolled her eyes. Perhaps shopping with her friend hadn’t been the brilliant idea it seemed at the time, all too often time spent with Meti meant time spent wrapped up in some strange scheme. The silence that greeted her raised a small, tingling thread of suspicion within the Kyrii’s mind. The Draik tried his best to look innocent; distracted slightly by trying to repair a little loose stuffing that had tumbled from a tear in his tail. The response sounded mumbled and muffled. “Meti, tell me right now!” The Kyrii stomped her foot, running out of patience. Hastily, the Draik gazed up with imploring eyes. Spectra sighed, closing her eyes. The little Draik scuffed a paw against the snow, trying his best to appear appealing and a little pathetic. Spectra would have loved to argue that the Day of Giving shouldn’t include maniacal fiends who sought to destroy and control Neopia, but in many ways, Meti’s words rang true. It wasn’t really the Day of Giving if Sloth didn’t get something and Spectra couldn’t imagine Neopians were lining up to bestow presents upon him. Sighing, she studied the contents of the window, causing Meti to smile slowly. The Kyrii gave him an irritated look. Nodding happily, Meti beamed, gazing around at the various stores and stalls. The problem seemed to be that beyond a fondness for chaos and destruction, neither Meti nor Spectra had a serious idea of what kind of gift would please an evil fiend. Meti loved any excuse for adventure and nodded eagerly. Spectra shuddered inwardly at the idea of going near any of those beasts, but nodded. It wasn’t going to help if they got Sloth something he hated. Meti was imagining along the same lines. Last year when his sister had been given a rainbow fuzzle, she had thrown a tantrum and screamed about not getting a pink one. Who knew what rage Sloth might unleash if displeased? With these thoughts in mind the two friends headed toward the Haunted Woods. The wind there hissed and tugged at the barren boughs of ancient trees, causing strange whispers that couldn’t be understood. Nervous, Meti glanced around; convinced every shadow was some savage beast that would make quick work of them. Edna’s Tower stood like an arrogant sentinel, the eerie green light that filtered from it’s high windows like a malicious gaze that cast its judgment over the surroundings below. The door was ancient and wooden; the knocker fashioned to look like sharp teeth, causing Spectra to wince even as she used it to pound at the flaking old wood. The hiss came from behind the closed door, causing both pets to jump. Trying her best to sound polite and sweet, Spectra cleared her throat. A snarl sounded from behind the door. Spectra looked to Meti helplessly, the Plushie Draik taking over the task of addressing the witch who remained closeted behind her door. A moment’s silence passed before the heavy door was thrown open, the hideous Zafara before them draped in billowing ebony robes, looking a little smug. Meti hid a smile. Perhaps even the vilest creatures appreciated a bit of recognition. Edna snorted in a derisive fashion. Meti frowned, that sounded rather expensive. Edna looked irritated, waving a wooden spoon at them. The two pets turned and ran; it wasn’t worth waiting around to find out what the witch would have them turned into if they lingered. Meti’s chubby, plushie legs pumped hard as he followed the lithe and swift Kyrii into the Haunted marketplace. Both were panting as they slumped against a wall. It took some time for Spectra to compose herself, but when she did, the Kyrii’s eyes widened in delight. To their left stood the dripping, drizzling Meerca who was the worst nightmare of anyone who didn’t wish to become a walking pile of sticky, disgusting snot. The creature was hovering around one of the shops, casting shifty looks at some Neopkins that sat in the window, giving Meti the uneasy feeling that the beast had no intention of paying. It really wasn’t worth thinking about what neopoints from Meuka would look like anyway. He had been about to suggest they turn and make a break for it when Spectra grabbed his paw and dragged him eagerly toward the slobbering, slithering creature. “Meuka, Sir?” The Kyrii ventured the question softly as the Meerca swung around, sending long, sticky strands of something disgusting and green flying, narrowly missing Spectra’s shimmering gown. The Meerca grunted something to them, causing Meti to blink. Another rambling grumble came their way, each word causing disgusting goo to fly around them. Meti tucked his tail behind him in concern. Meuka studied them with beady black eyes, then took a drenched rag from somewhere, blowing his nose and creating what was possibly the most disgusting trumpeting sound the friends had ever heard. It did seem to clear his throat, though, for when he replied, it was clear and easy to understand. Meti exchanged an awkward glance with Spectra as Meuka continued. No one dared comment on the irony of fashion advice from a dripping ball of mucus. Meti wrinkled his nose in distaste. Meuka shrugged, starting to head away. As he turned his back, drenching a nearby Usul in a wave of yellow and green goo, he glanced over his shoulder. Spectra didn’t bother to point out they weren’t going to seek out some innocent Grundo to serve Sloth’s bizarre plans. A little dejected, the two friends headed home. Later in Meti’s neohome, the two sat, dismal and utterly devoid of ideas. Spectra nodded in a miserable fashion, glancing up to see a slow smile spreading across Meti’s face. The Plushie Draik grinned, standing and grabbing the small pouch that contained his neopoints. Spectra looked horrified. Had her friend lost too much stuffing and gone mad? The Draik giggled, grabbing his friends hand and leading her to the marketplace. In the hustle and bustle of the markets, Neopets from all over Neopia were scrambling for last minute gifts. Shops were already putting closing signs up; they didn’t have long. Finding the store he sought, Meti led the way, opening the door and running to a nearby shelf. Spectra glanced curiously over his shoulder, then lit up into a delighted smile. 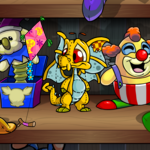 In his hand, the Draik held a Yellow Clockwork Grundo. Several more lined up on the shelf behind him. Finally, Sloth could have the Grundo army of his dreams and Neopia would remain safe! It took all the money they had, but the two pets purchased twenty of the little clockwork Grundos, letting the store owner gift wrap them in bright crimson and green paper, with a shimmering bow perched jauntily atop the package. The dawn of the Day of Giving created a symphony of happiness. Even in Sloth’s cold, sterile space station, Grundo workers had strung up lights that blinked and fizzled, their attempt to bring some holiday cheer to a rather miserable environment. Carefully holding Meti and Spectra’s package, which had arrived that morning, Sloth frowned, glancing to one of his Grundo minions. The Grundo glanced up wearily. Sloth looked rather impressed, ripping open the pretty paper and smiling slowly. The old Grundo minion rolled his eyes a little. Note from the authors: Anjie and Chivo wish Neopia a happy holiday season!